2017 Taiwan International Balloon Festival is an annual event and has been coming to its 6th consecutive year. The event is going to happen on 30th June to 6th August 2017 at Taitung Luye Gaotai. The sight is grand with sky fills with colorful hot air balloons. This year’s highlights inculde the night glow concerts on the grassland of Luye Gaotai in Taitung. There are four nights at 8pm and two happening at the crack of dawn! That makes a total of magnificent 6 night glow concerts. There are held on different townships in Taitung County, therefore, will have to follow-up on the exact schedule and venue. Luye Gaotai is in Luye Township and others in the same county include Chenggong Township, Chishang Township, Taimali Township, Beinan Township and Taitung City. Earlier this year, I published a post on Hot Air Balloon in Luye Gaotai Taitung with a short description of event. You might want to view the video to have an idea of this festival last year. During this period of the grand festival, accommodations and train tickets could possibly be fully booked. It happens every year. So, it’s good to book in advanced to avoid disappointment at the eleventh hour. Another thing to take note is the weather. If there is a typhoon forecast on that week, schedule might change. Mind you, this period has frequent typhoons. Take note. Put this in your bucket list if you are traveling to Taiwan during this period of time, 30th June to 6th August 2017. Be sure to catch the annual event. Below are the offical websites which include schedules fo Balloon Tethering Ride, how to get to Luye Gaotai, emergency information and more. Weather forecast by Central Weather Bureau. More information Taitung, Taiwan, Taiwan International Balloon Festival, 2017. Video credit: @arashi161616 . Your video has been selected for featuring. We are grateful for your support and contribution. Thank you. #ExploreTaiwan Image Curation . 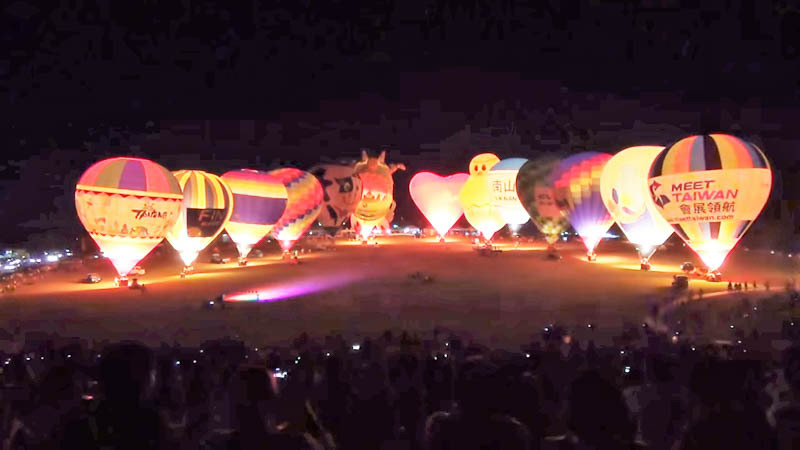 Ѽ: Taiwan international Ballloon Fiesta, Luye Gaotai, Taitung County. (鹿野高台) . 🍏 "Set forth! Make your Summer sky full of colors and good vibes!" . Hello and good vibes to everyone! . Please congratulate our talented Insta-friend in the comments below and take time to check out @arashi161616 gallery for more beautiful shots of Taiwan! Taiwan is "The Heart of Asia." . Dream. Explore. Discover. Set forth! Be adventurous and creative. @ExploreTaiwan; more than just sightseeing! Your support means a lot in shaping the leading hashtag #ExploreTaiwan. Build a better community. Help us spread the words. Remember these 3 easy steps: 1. Follow, tag, and like us on our post. 2. Discover other photos, #ExploreTaiwan. 3. Love them with all your Likes & Comments. . #臺灣 #台灣 #Taiwan #goprotaiwan #gopro #goprooftheday #goprohero3 #goprouniverse #goprohero4 #goprophotography_ #goprophotography #gopro3 #goproid #gopronation #goprobrazil #goprolife #goprovideo #video #videooftheday #videogram #vid #vids #videos #hotairballoon #hotairballoons #balloon . Previous Luce Memorial Chapel, Nanya Rock Formation, and More!